The SEC East is already a mess, but things can get really chaotic if the right results play out. Here's how Florida, Georgia, Kentucky, South Carolina, Tennessee and Vanderbilt can end up tied and other crazy scenarios. While the rest of the nation concentrates on a College Football Playoff race that feels awfully chalk-heavy at the moment, one corner of the country braces for pure college football chaos. O.K., it's the most mediocre brand of chaos possible, but that doesn't make it any less chaotic. The agent of this potential chaos is a team with a first-year head coach that wasn't expected to make a bowl game this season. Saturday, that first year head coach will bring his team to the school that fired him two years ago after he lost to the program he now coaches. This is only a taste of the potential drama in store across an entire division. The SEC East may lack in quality, but it has cornered the market on weird. How weird? What happens Saturday could set events into motion that could lead to a six-way tie atop the division. Once again, Will Muschamp will stand in the Swamp for a noon game between South Carolina and Florida. The last time these two teams met, in 2014, Muschamp coached the Gators. Neither team seemed to want to win for the first 60 minutes, but Steve Spurrier's Gamecocks left Gainesville that day with a 23–20 overtime victory. The next day, Muschamp was fired. 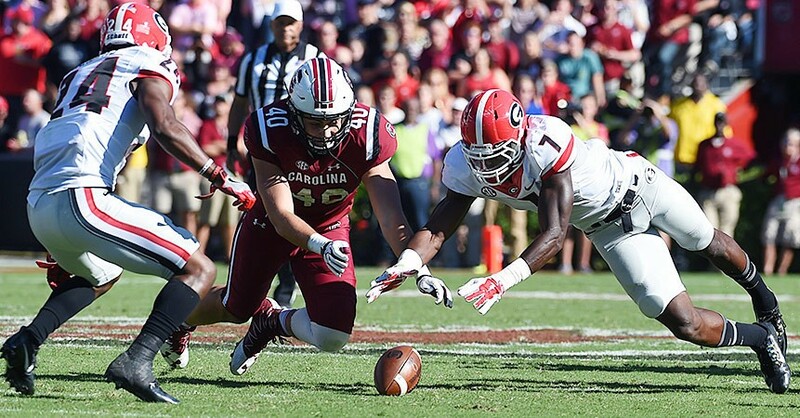 Now he's back with a quarterback (Jake Bentley) who skipped his senior year of high school and has gone 3–0 as a starter since his redshirt was set ablaze during the bye week. Florida will be without starting quarterback Luke Del Rio (shoulder), center Cam Dillard (knee), linebacker Alex Anzalone (arm), linebacker Jarrad Davis (ankle) and defensive end CeCe Jefferson (foot). BOWL PROJECTIONS: Who will make the playoff, all 40 bowl games? If South Carolina wins Saturday, it would mark the first step toward the most SEC East finish possible. The division is so mediocre that the best conference record its champion can have is 6–2. The more likely record of the champ is 5–3. And it's still mathematically possible for all but one team in the East (sorry, Missouri) to finish 4–4 in conference play. How might the SEC East reach peak Meh? Let's examine all the possible scenarios. Florida: Beats South Carolina and LSU. No one who watched Florida's offense against Arkansas last week and then watched LSU's defense against Alabama is predicting this result. Kentucky: Beats Tennessee, Florida loses to South Carolina and LSU. The Wildcats are one of the better stories of this season. They looked lifeless in their first two games and then came roaring back. But a loss to Georgia on a last-second field goal last week has left them needing a lot of help. Florida-Kentucky: Florida goes 1–1 against South Carolina and LSU, Kentucky beats Tennessee. Florida wins the title by virtue of its head-to-head win against Kentucky. Florida-Tennessee: Florida goes 1–1 against South Carolina and LSU, Tennessee beats Kentucky, Missouri and Vanderbilt. Tennessee wins the title by virtue of its head-to-head win against Florida. The second of these still feels like the most likely outcome. Even with Tennessee's dire injury situation, the Volunteers should be able to beat Kentucky, Missouri and Vanderbilt. But we also thought the Vols would beat South Carolina in spite of their dire injury situation, so perhaps it isn't safe to assume. Florida-Kentucky-South Carolina: Florida loses to South Carolina and LSU, Tennessee beats Kentucky and loses to Missouri and Vanderbilt. Divisional record used to break three-way tie eliminates Kentucky (3–3). South Carolina wins the title by virtue of its head-to-head win against Florida. So far this season, the teams of the SEC East are 1–9 against teams from the SEC West. What's crazy is the one win (Kentucky beat Mississippi State) would knock the Wildcats out of the mix in this scenario. Florida-Georgia-Kentucky-South Carolina: Florida loses to South Carolina and LSU, Georgia beats Auburn, Kentucky loses to Tennessee, Tennessee loses to Missouri and Vanderbilt. Divisional record is used to break the four-way tie. Georgia (3-3) and Kentucky (3-3) are eliminated. South Carolina wins the title by virtue of its head-to-head win against Florida. Now we begin the series of scenarios that would require Georgia to beat Auburn. Watching these teams play in recent weeks inspires no confidence that this could actually happen, but we should doubt Georgia's Rodrigo Blankenship* at our own peril. *The intriguing subplot to the Blankenship tale is that his father told the Atlanta Journal-Constitution that if Blankenship, a walk-on, doesn't receive a scholarship after his performance this season, he may leave for a school that will give him one. Florida-Georgia-Kentucky-South Carolina-Tennessee: Florida loses to South Carolina and LSU, Georgia beats Auburn, Kentucky loses to Tennessee, Tennessee goes 1–1 against Missouri and Vanderbilt. Divisional record is used to break the five-way tie. Georgia (3–3) and Kentucky (3–3) are eliminated. Cumulative conference winning percentage of non-divisional opponents used to break three-way tie. South Carolina wins the title by virtue of head-to-head wins against Florida and Tennessee. Florida-Georgia-Kentucky-South Carolina-Tennessee-Vanderbilt: Florida loses to South Carolina and LSU, Georgia beats Auburn, Tennessee beats Kentucky and Missouri, Vanderbilt beats Missouri, Ole Miss and Tennessee. Divisional record is used to break the six-way tie. Georgia (3–3), Kentucky (3–3) and Vanderbilt (3–3) are eliminated. South Carolina wins the title by virtue of head-to-head wins against Florida and Tennessee. Congratulations, Gamecocks. This scenario theoretically gives you the right to get smashed by Alabama in Atlanta on Dec. 3. But to give the six-way tie any chance at becoming a reality, you've got to beat Florida first.